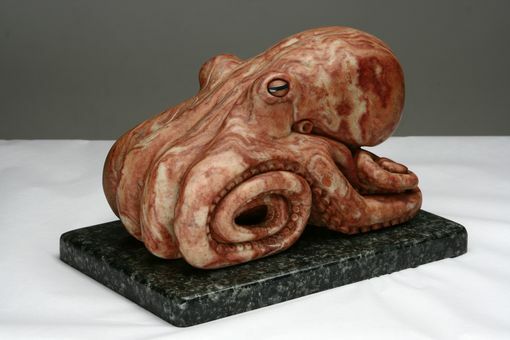 This marine life sculpture is currently available direct from "The Stone Sculptor". It was carved from Raspberry Red Alabaster. The eyes are hematite. It is shown on a granite base; however, it is not attached... it can be permanently attached to a customized base of your choosing (I think a natural mineral specimen such as calcite might be interesting). This carving has a lot of detail, including hundreds of suction-cups. The pattern and colour of the stone reminded me of a specific species of octopus; the Veined Octopus, AKA the Marginated Octopus (Octopus Marginatus is the Latin name). Dimensions: 13"x8"x8" (not including base). Weight is about 33 lbs (not including base).